Ron Lebert was born in 1942 in Watertown, South Dakota. After completing his Bachelor of Science degree in Civil Engineering at South Dakota State University, he was commissioned a 2d Lt in the U.S. Air Force through the Air Force ROTC program at South Dakota State on June 6, 1965, and went on active duty beginning August 17, 1965. Lt Lebert next completed Undergraduate Navigator Training and was awarded his navigator wings at Mather AFB, California, in May 1966, followed by Electronic Warfare Officer (EWO) Training at Mather from June 1966 to May 1967. 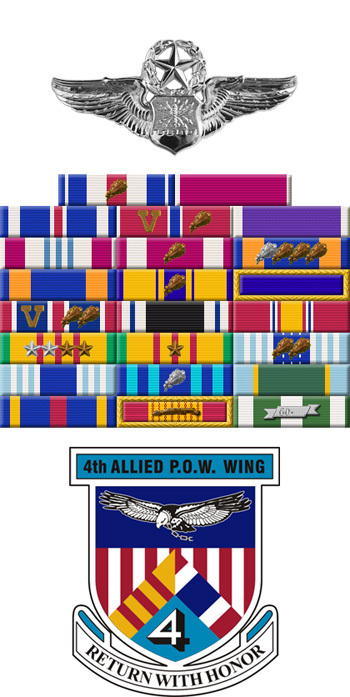 His first assignment was as an EWO on EB-66 Destroyer electronic countermeasures aircraft with the 41st Tactical Electronic Warfare Squadron at Takhli Royal Thai AFB, Thailand, from May 1967 until he was forced to eject over North Vietnam while flying his 89th combat mission and was taken as a Prisoner of War on January 14, 1968. After spending 1,887 in captivity, Capt Lebert was released during Operation Homecoming on March 14, 1973. He was briefly hospitalized to recover from his injuries at Travis AFB, California, and then served as a civil engineering officer with the 60th Civil Engineering Squadron at Travis from October 1973 to July 1976. During this time, he also served as a C-141 Starlifter navigator with the 60th Military Airlift Wing at Travis. 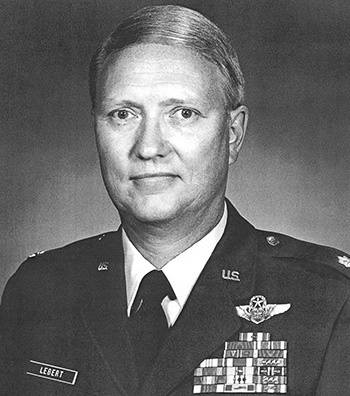 Col Lebert attended Air Command and Staff College at Maxwell AFB, Alabama, from August 1976 to August 1977, followed by service as an EWO aboard MC-130E Combat Talon aircraft with the 7th Special Operations Squadron at Rhein-Main AB, West Germany, from November 1977 to November 1981. While at Air Command and Staff College, he completed his Masters degree in Business Administration from Auburn University. His next assignment was as the European Division Plans and Policy Officer of the Joint Special Operations Command at Fort Bragg, North Carolina, from November 1981 to September 1984, and then as Deputy Chief of Plans and Programs in the Engineering and Services Division of the National Guard Bureau in the Pentagon from September 1984 to September 1988. Col Lebert's final assignment was as the Electronic Warfare Development Officer in the Air National Guard Requirements Division at the Pentagon from September 1988 until his retirement from the Air Force on July 1, 1990. After retiring from the Air Force, Ron owned and operated a Paul Davis Restoration Franchise for 15 years. First Lieutenant Ronald M. Lebert distinguished himself by gallantry in connection with military operations against an opposing armed force over North Vietnam on 14 January 1968. On that date, Lieutenant Lebert, by his outstanding display of professionalism and courage in the face of hostile fire from unfriendly forces, even though his own unarmed EB-66C aircraft was shot down, was highly instrumental in the overall success of the air operation. By his gallantry and devotion to duty, Lieutenant Lebert has reflected great credit upon himself and the United States Air Force.